It’s pretty easy to tell someone’s interests by following them on Twitter. But HP thinks it can automate the process a bit further. The company has a new app, called Twynergy, that can look at a user and associate him or her with various topics. Twynergy, designed for HP’s WebOS, made its public debut over the weekend when it was shown off in a speech by PC unit CTO Phil McKinney, appearing at the Maker Faire in San Mateo, Calif.
“It’s all about taking your Twitter feed and discerning areas of interest,” McKinney said. The app doesn’t just create a word tag, but also looks at the content on sites that are linked to in tweets. 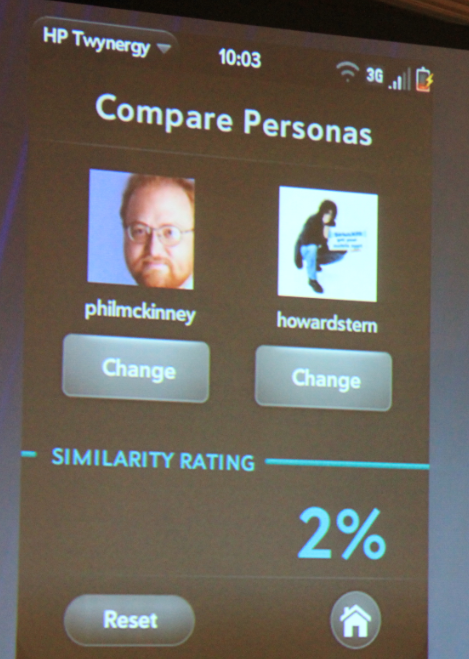 Twynergy can also be used to compare two profiles to see how similar they are. For instance, McKinney noted that he and Howard Stern only have 2 percent overlap. “That’s a good thing,” he told a crowd attending Maker Faire, an annual Silicon Valley event that is something of a cross between a science fair and a county fair. McKinney said that he and Oprah shared 7 percent, while he had roughly 50 percent overlap with motivational speaker Tony Robbins. As for the celebrity with whom he had the most in common, McKinney said he was surprised to see it was President Barack Obama, with 86 percent similarity. McKinney also used his talk with the crowd of Maker Faire hackers to show off Palm’s TouchPad WebOS tablet, due to ship this summer, controlling a fan and lamp and monitoring temperature, all wirelessly. 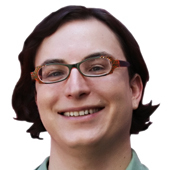 McKinney said that HP needs the help of all the “makers” out there to develop cool apps. Finally, McKinney also used his Maker Faire appearance to kick off a new effort to develop tools to aid those with autism. HP and its advertising agency, Goodby Silverstein, are kicking off a project called Hacking Autism, aiming at summoning more people to develop technology to aid those with autism. The effort will include an October “hack-a-thon” in Silicon Valley aimed at getting some ideas under way. McKinney noted that 1 in 100 people are now born with autism in the U.S. In Silicon Valley, the rate is more like 1 in 80. “It’s a full blown epidemic,” he said.